Seattle improved to 8-4 on the season and propelled itself back into playoff contention with the help of the Atlanta Falcons' 9-14 loss to the Minnesota Vikings earlier on Sunday. Seattle Seahawks quarterback Russell Wilson throws a touchdown pass against the Philadelphia Eagles during the fourth quarter of their NFL game at CenturyLink Field in Seattle, Washington, on December 3, 2017. The Seahawks won 24-10. 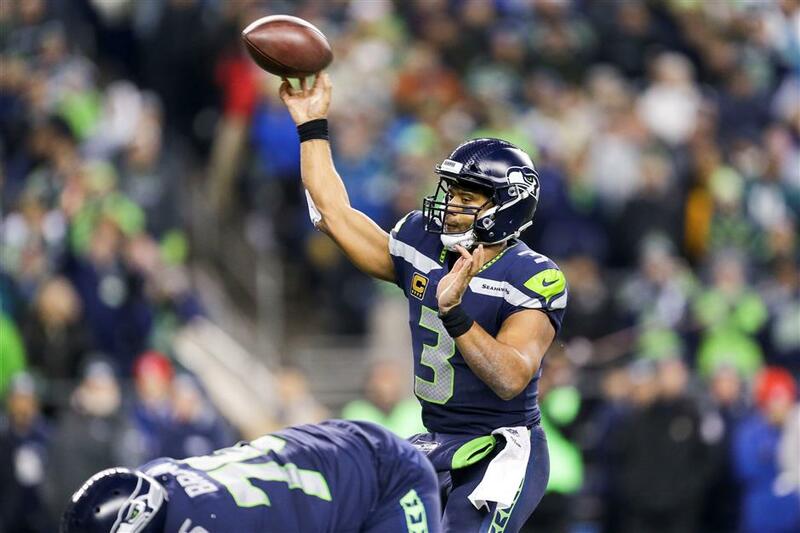 Russell Wilson tossed three touchdown passes and Seattle's defense held the NFL's No. 1 offense to a season low in points as the Seahawks upset the Philadelphia Eagles 24-10 on Sunday. Wilson outgunned Eagles high-flying quarterback Carson Wentz and the Seahawks snapped Philadelphia's winning streak at 10 games. "We had to play great football," said Wilson. "They are a great football team, well coached and great players. "We had to come out strong and stay the course and then finish really strong. We responded really well. They would score and then we would come back and score. The guys played great all night." The Eagles (10-2) dropped into a tie for top seed in the NFC with the Vikings, who also have 10 wins. In the NFC West race, the Seahawks remained a game behind the Los Angeles Rams (9-3), who beat the Arizona Cardinals 32-16 earlier in the day. Wentz completed 29 of 45 throws for 348 yards, with one TD and one interception. Wilson hit 20 of 31 for 227 yards and threw scoring passes to tight end Jimmy Graham, Tyler Lockett and running back JD McKissic. Elsewhere, a fired-up Tom Brady notched another milestone NFL win as the Super Bowl champions New England Patriots powered past the Buffalo Bills 23-3. Brady connected on 21 of 30 passes for 258 yards as he notched his 27th career victory over the Bills. He broke Brett Favre's league record for most quarterback wins against a single opponent. Brady also joined Favre, Peyton Manning and Drew Brees as the only NFL quarterbacks with at least 65,000 career passing yards. The Patriots improved to 10-2 — their 15th straight seasons with at least 10 wins — but it wasn't always pretty. New England didn't score a touchdown in the first half for the first time this season and Brady's frustration boiled over with some choice words for offensive coordinator Josh McDaniels after the Pats' first field goal. Rex Burkhead rushed for two TDs. Tight end Rob Gronkowski caught nine passes for 147 yards but delivered an ugly late hit on Bills cornerback Tre'Davious White with the game well in hand in the fourth quarter. White was evaluated for a head injury after intercepting Brady late in the fourth. Gronkowski drove his shoulder into White as he lay face down on the turf after the whistle. "There is no room in this league for that type of crap," Bills safety Jordan Poyer said, and Gronkowski himself was apologetic after the game. "I was just really frustrated at that moment," Gronkowski said. "I don't really believe in those type of shots." The Bills lost for the fourth time in five games. Making matters worse, Bills quarterback Tyrod Taylor was carted to the locker room with a knee injury early in the fourth quarter. In other National Football League games on Sunday, it was: Saints 31, Panthers 21; Chargers 19, Browns 10; Raiders 24, Giants 17; Jets 38, Chiefs 31; Packers 26, Buccaneers 20 (in overtime); Titans 24, Texans 13; Ravens 44, Lions 20; Jaguars 30, Colts 10; Dolphins 35, Broncos 9; and 49ers 15, Bears 14.